I’ve talked a lot about how ‘connected’ we are to social media, so I suppose this is a ‘if you can’t beat them, join them’ post. There are so many ‘apps’ out there these days, there are even some good ones for hiking! Map My Hike is fitness tracking application that uses the GPS of your mobile device to record the path, duration, distance, pace, speed and elevation of your hike as well as things like calories burned… I don’t know what calories are, but it sounds important! The app is FREE and available on both iphone and Android devices. Map My Hike, like a lot of fitness trackers can also serve as a good motivator. The app offers verbal prompts (which can be turned off if you don’t being told what to do!) telling you how far you have travelled. The app has a really good user interface. I like the way the information is presented to you in graph form – I like seeing the little lines progressing. (I need to get out more!) It also serves as a good motivator for me to improve my performance and challenge myself to achieve milestones. The app can be synced to your other fitness tracking devices/apps such as MyFitnessPal and Google Fit so that you can track all of your activities using the best app for the activity you’re undertaking and then simply sync the data; so it’s all in one place. It’s also very simple to share your information via Twitter or Facebook which is nice when you’ve just smashed out 20 kilometres- nothing like a cheeky brag! Map My Hike has received good reviews and seems to work best if you have the latest… well… everything. As long as your phone is the current model, the OS is current and you’ve updated the app recently you should get some pretty accurate readings. The struggle with these kinds of fitness trackers is they rely on GPS signals to your phone which can be pretty unreliable out on the tracks. It also hurts that the GPS signal drops in and out which affects the accuracy of speed and distance readings. Another disadvantage of the app is the darn ads! Ads are everywhere, I go out to get away from the bombardment but Map My Hike likes to bring them for me (ugh). That said, if you decide you like the free app, you can always upgrade to ‘Pro’ which gets rid of all those ads. I guess I’m just cheap! Map My Hike is a good tool to use to track your hiking progress; assuming that you have the latest GPS technology on your phone. I wouldn’t rely on the information to be 100% accurate but it’s certainly offering you a good overall glimpse at what hikes you have completed and serves as a good motivational tool. First Aid- Australian Red Cross is a free resource that can be used as a guide to render first aid out on the trails. This is one of those apps that you might like to have ‘just in case’. The app is easy to use and gives good, step by step instructions and advice for common emergencies. Thankfully, the app is designed as an educational tool so it divides the information up into four sections. Learn, Prepare, Emergency and Test Your Knowledge. The idea is that you’ve already had a look at the information in the app before you’ve encountered an emergency BUT you can also access life-saving interactive information in the event of needing to render CPR etc. There are many reviews on-line who suggest that this app should come as standard on all devices – I couldn’t agree more. In the event that you take a fall in a remote area and you have some time on your hands before emergency services get to you, the app can be used to help you successfully apply first aid. The app is great to use as a ‘reminder’ tool. It should not and cannot be used in replacement for a basic first aid course. It’s a reference tool, not a ‘oh crap what do I do now’ tool. Some situations and instructions don’t have illustrations so it can make it tricky to understand what the app is telling you to do, but again, if you have basic knowledge you should be able to apply the information successfully. 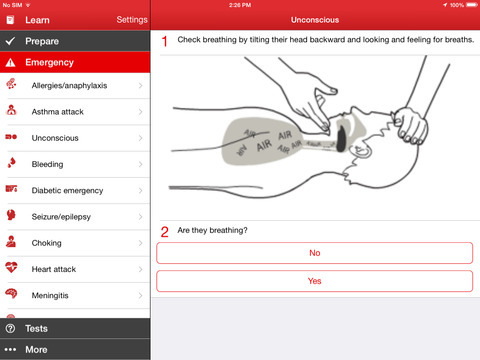 The First Aid- Australian Red Cross app is worth having. It is free and could honestly save a life. If you’re running short of memory on your phone maybe think about deleting candy crush and replacing it with something worthwhile. NB: I upgraded from Candy Crush to Frozen Free Fall a while ago, get with the program.